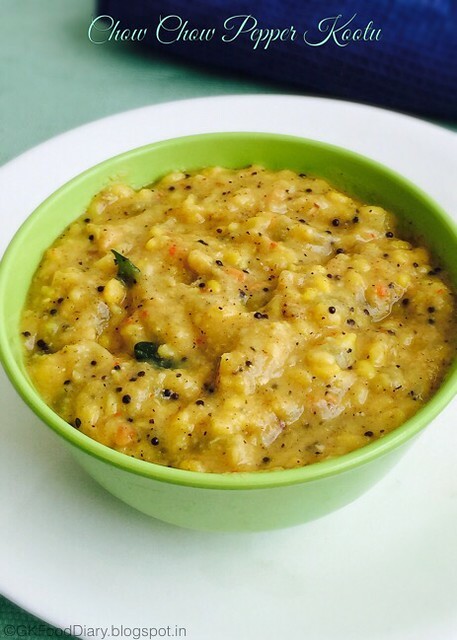 Kootu is my favorite and love it with any tangy gravy. 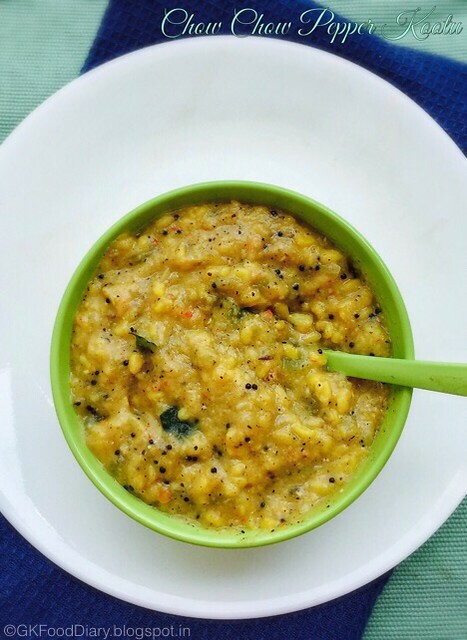 We usually make kootu with moong Dal, green chilli and coconut paste. This chow chow kootu is slightly different from the usual kootu with the addition of pepper. This is my grandma’s recipe passed to me from my mom. This kootu can be tried with snake gourd, bottle gourd or even ash gourd instead of chow chow/chayote. Let’s see how to make this pepper kootu with chow chow. 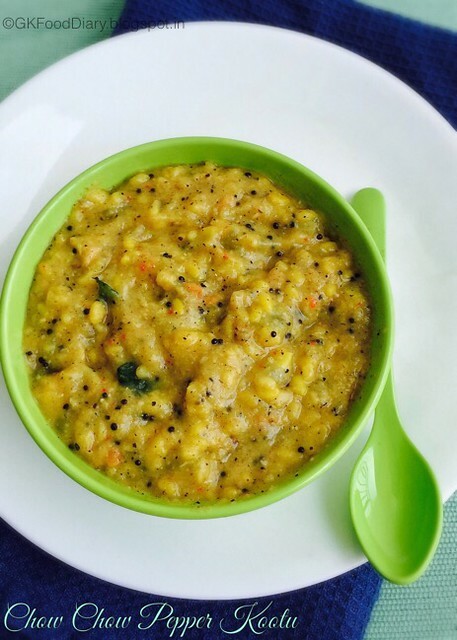 South Indian Tamilnadu style flavorful Chow Chow Kootu with moong dal and black pepper. Heat ½ tsp of oil in a pan and add all the items to roast and grind except coconut. Roast them until golden brown and finally add grated coconut. Give a quick stir and switch off. Transfer the roasted ingredients to a mixer. Grind it to a coarse powder without adding any water. Set aside. Peel the skin off from chow chow and cut into two vertical pieces. Remove the white part in the middle.Then chop them to small cubes.Take the chopped chow chow pieces and moong dal in a small pressure cooker along with turmeric powder and salt. Add a cup of water to it. Pressure cook it for three whistles and open the cooker once the pressure released. Now add the ground spice powder to the pressure cooked chow chow and mix it slowly. Start boiling the kootu in low medium flame for 5 minutes or until the kootu consistency is reached. Switch off the flame once done. Heat a tadka pan and add the items to temper. 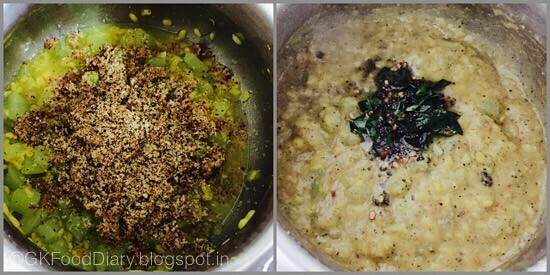 Let the mustard seeds crack and urad dal turns brown, then add curry leaves. Fry for a minute. 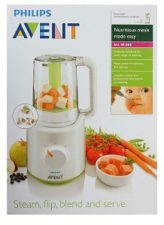 Transfer the tempered items to the kootu and mix it well. 1. Heat 1/2 tsp of oil in a pan and add all the items to roast and grind except coconut. Roast them until golden brown and finally add grated coconut. Give a quick stir and switch off. 2. 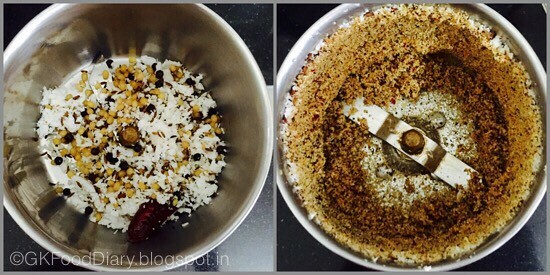 Transfer the roasted ingredients to a mixer. Grind it to a coarse powder without adding any water. Set aside. 1. Peel the skin off from chow chow and cut into two vertical pieces. 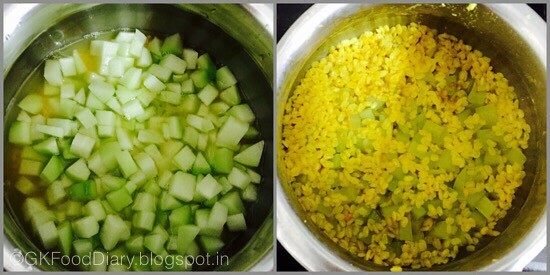 Remove the white part in the middle.Then chop them to small cubes.Take the chopped chow chow pieces and moong dal in a small pressure cooker along with turmeric powder and salt. Add a cup of water to it. Pressure cook it for three whistles and open the cooker once the pressure released. 2. Now add the ground spice powder to the pressure cooked chow chow and mix it slowly. Start boiling the kootu in low medium flame for 5 minutes or until the kootu consistency is reached. Switch off the flame once done. Heat a tadka pan and add the items to temper. 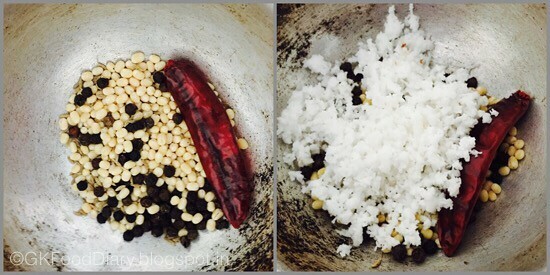 Let the mustard seeds crack and urad dal turns brown, then add curry leaves. Fry for a minute. Transfer the tempered items to the kootu and mix it well. 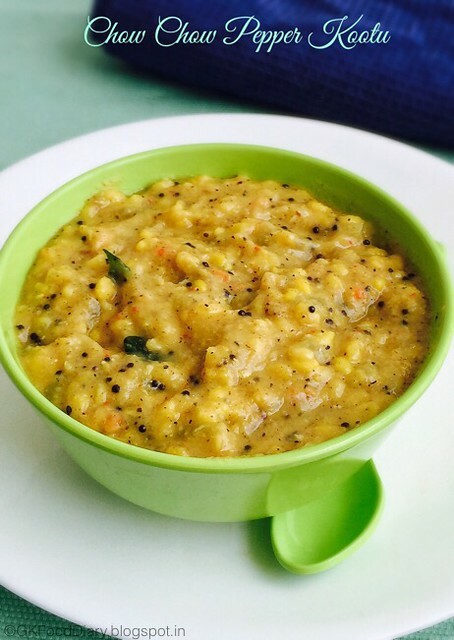 Serve the chow chow kootu with steamed rice and any tangy kuzhambu of your choice. Keep the flame in low to medium while boiling the kootu in order to avoid the bottom to get sticked. If the kootu is watery add a tsp of rice flour in the end and boil it for 2 minutes to make it thick. The same recipe can be tried with snake gourd, bottle gourd or even white pumpkin/ash gourd. This kootu thickens with time so switch off the flame accordingly.